The flagship store of Road to Awe (RtA) is as streetwise as the clothes produced by this Los Angeles fashion brand. 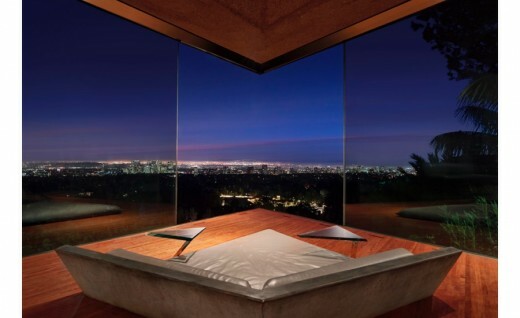 Los Angeles architect Dan Brunn, AIA, created a complex, dream-like space with geometric precision, meditative sensations, and positive/negative dualities. 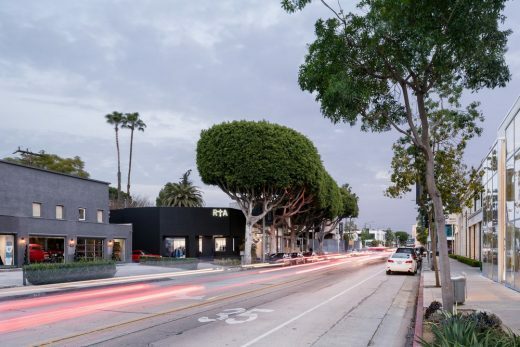 Graced with street exposure from two sides, the streamlined boutique proclaims its variably angled black facades to the public. Dan Brunn Architecture renovated a 1,200-square-foot, 1970s building to create the new retail space, maintaining its footprint, but completely reshaping its geometry to create a more cohesive, sculptural experience. 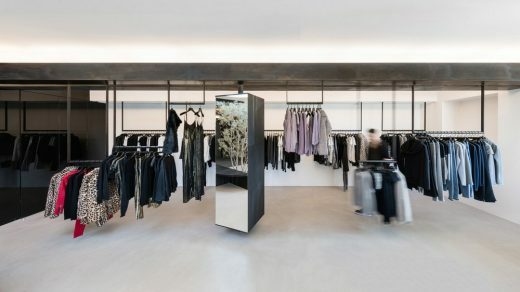 Inside, the 10-foot-tall space features concrete floors, black mirrors, wood surfaces, and blackened steel beams, creating a minimalist backdrop to the edgy fashion. An interior garden contributes calm and brings a mannered sense of nature into the scene. 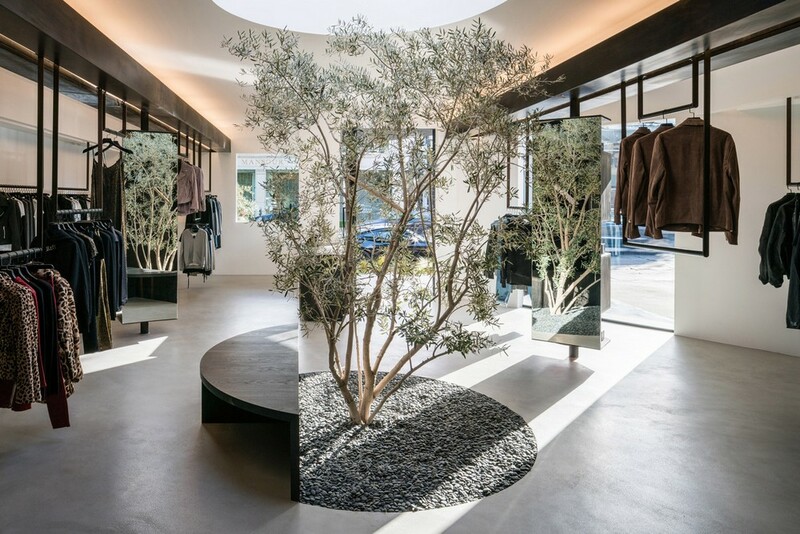 Instead of installing typical storefronts that allow the merchandise to be viewed at a glance, Brunn reduced the amount of exterior glass to create a more exclusive atmosphere. A large window is set at an angle to face traffic moving east, while smaller windows provide views of the interior at the pedestrian scale. Reducing the size of the windows lends an air of exclusivity, offering a selective experience of the brand and encouraging the curious to venture inside to discover the goods. 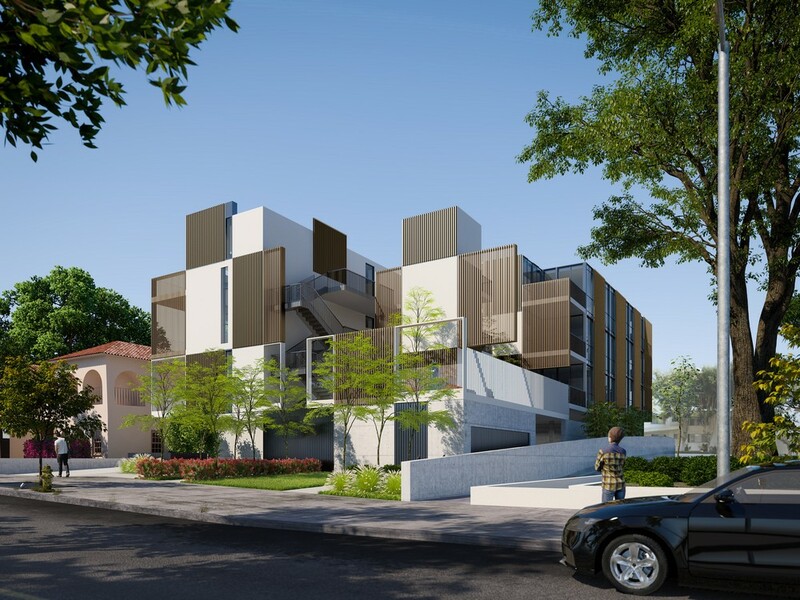 An added sense of mystery is achieved by the new “floating” canopy in front of the building. A floor-to-ceiling pivot door seamlessly blends with the black exterior when closed, and generously welcomes shoppers when open. There is a constant interplay between open and closed, light and dark, and exposure and concealment. 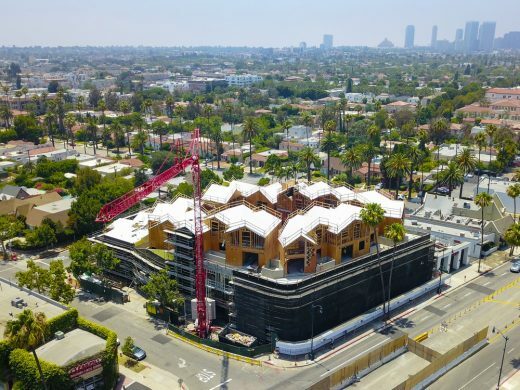 created by Japanese landscape designer Hitoshi Kitajima of Kaisei-en, is meant to represent LA’s Asian influences and provide the “awe” represented by the fashion brand. Merchandise surrounds visitors in display areas stretching along the sides of the 30-foot-by-40-foot space. Clothing is hung on a custom hardware system of four planes of suspended roller tracks set into both the white soffits and the blackened steel beams. Hangers easily slide to reveal the layers of merchandise and maintain the richness and depth of space integral to the design. Custom-designed wooden cases extending to the beams rotate to reveal mirrors or positive/negative insets that display for-sale books and accessories. Brunn also configured built-in ash furniture in the showroom to animate the space with a lively play of symmetry and asymmetry through careful calibration of pure elements. The rec_linear sales desk at the front precisely aligns with the slab bench at the back. At the space’s midpoint, an imaginary line created by the sales desk and the slab bench appears to “slice” a circular seat, creating an alignment with the edges of the other furniture. 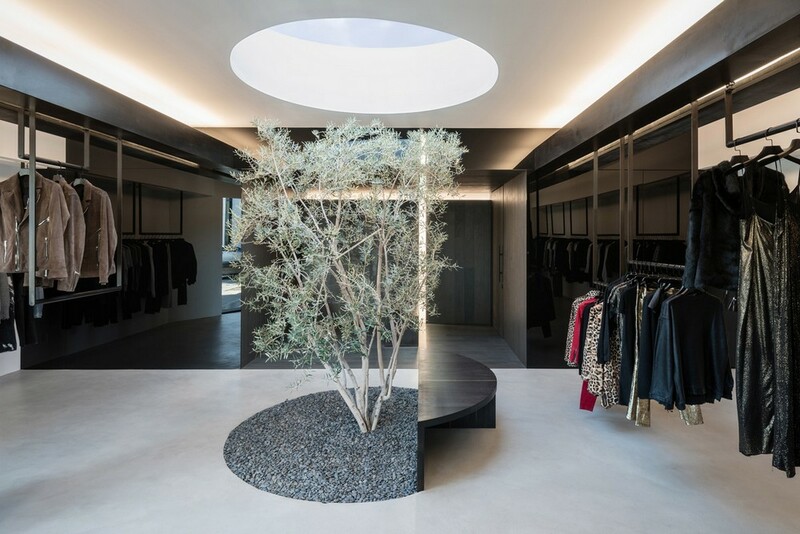 At the rear of the store, a fitting room and a bathroom flank a generous waiting area with a long cantilevered blackened steel bench where friends can sit while shoppers try on clothes. 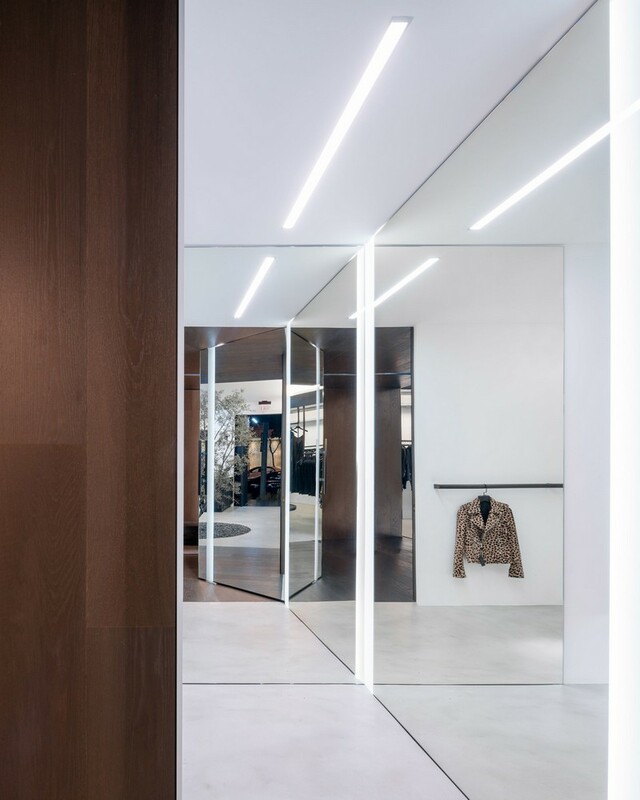 Not merely a changing/waiting area, this nook serves as a catwalk for customers, as the large fitting room door swings open to reveal a 9 foot by 8 foot mirror. 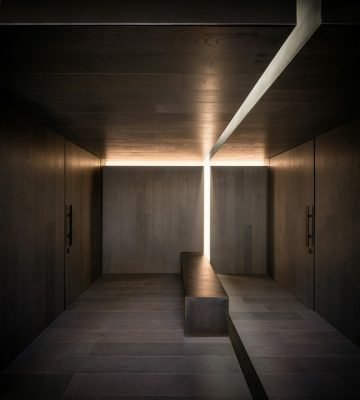 The space is completely clad in ash on the floor, ceiling, and walls to unify this area. A back-lit “T”—formed by slots and recesses in the wood surfaces—takes on the asymmetry of RtA’s logo lower-case letter, further symbolizing the brand. Brunn has been commissioned to design additional stores for Road to Awe in other cities, including the next retail space for the fashion brand in New York City.